Choose from many different styles and personalize your piece with a custom etched monogram. Flat fee of only $25! Crystal Classics offers high quality engraving services on most pieces, whenever physically possible. Our engraving services offer a wide range of customization, and are suitable for personalization, special messages, weddings and company gift giving. Company logos can also be engraved onto the piece. You can e-mail artwork for logos separately to my.engraving@crystalclassics.com. You must reference your order number if e-mailing the artwork separately. Please e-mail your artwork as black and white pdf (Adobe Acrobat) files. We can also accept bitmap, jpeg, eps or tiff files of at least 300 dpi resolution. Engraved item sales are final. 4) We will send you the proof prior to engraving. The proof will be sent to the e-mail address entered on the checkout page. 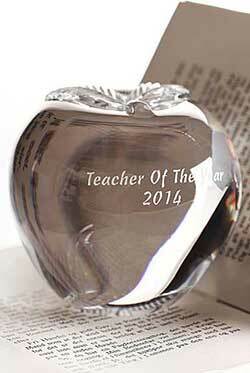 The format used is Adobe PDF and it will depict the actual size and shape of the engraving. If you wish to receive a faxed proof, please choose that option and enter your fax number. Your piece will not be engraved until we receive the proof approval from you. *If less than 3 business days from today there will be a $25 expedite charge and overnight shipping charges added. 6) Once you have set the fields above, click on the button below to add engraving to your cart. 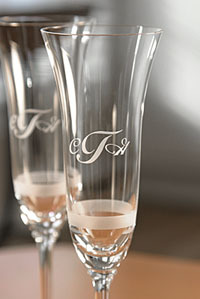 Crystal Classics offers high quality Monogram service on all pieces available (whenever physically possible). Our engraving studio is equipped with the latest state-of-the-art computerized technology producing the highest quality monogramming available. To place an order, select a piece by adding it to the shopping cart, than fill in the fields below and add monogramming to your shopping cart. The initials are usually placed in order First, Last (larger), Middle For example James Allison Cook monogram would be JCA with C being larger than the rest of the monogram. Couple monogram for the weddings and anniversaries would be Groom, Last Name, Bride. For example John and Gina Fetzer monogram would be JFG with F being the larger letter. 6) Once you have set the fields click on the button below to add engraving to your cart.